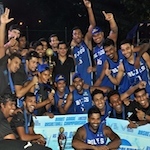 Sri Lanka posted the first win at the U18 Asia Championship. They held off Qatar and set up the clash with India for the 13th place. Qatar will look for the initial win at the tournament when they take on Saudi Arabia tomorrow. Sri Lanka pulled ahead early in the game. They maintained the lead throughout the stanza and posted a narrow 16:14 lead ten minutes into the game. Sri Lanka managed to clear off in the second term. They rallied to a 29:23 halftime advantage. Sri Lanka used an 8:3 run early in the third quarter to open a double-digit advantage. Sri Lanka posted an 11-point lead at the final intermission. Qatar bounced back at the start of the fourth quarter. They exploded with a 14:4 run to narrow the deficit. But Sri Lanka stopped the rot and kept Qatar scoreless throughout the rest of the contest. Clinton Stallon Thevakumar (180-G-93) notched 14 points for Sri Lanka. Madhushanka Rathnayake (185-G-92) contributed 12 points in the winning case. Ali Al-Kuwari (92) and Bader Ba-Sulaiman (93) answered with 14 points each for Qatar. Saeed Al-Hajri accounted for 10 points in defeat.